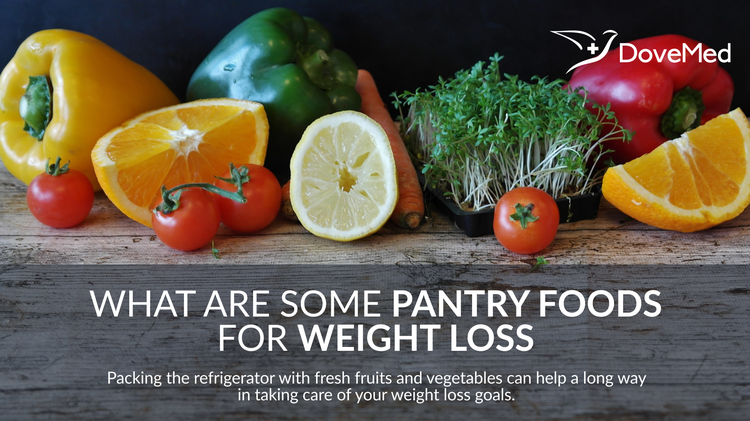 What Are Some Pantry Foods For Weight Loss? A healthy pantry must contain fruits, vegetables, pasta, rice, canned meats, soups, sauces, and a few other spices. These can be stocked in the refrigerator for a quick meal that would help one maintain their weight as well. After coming back from work, everybody wants some quick fixes for a meal. For this, a well-stocked pantry is mandatory. A healthy pantry must contain fruits, vegetables, pasta, rice, canned meats, soups, sauces, and a few other spices. These can be stocked in the refrigerator for a quick meal that would help one maintain their weight as well. The world is racing towards obesity and weight gain. Achieving a healthy weight loss can prevent people from weight-related problems like cholesterol, arthritis, cardiovascular illnesses, diabetes, and even cancer. A well-stocked pantry can help one in weight loss. When the kitchen is stocked with foods that can help you avoid any weight gain, then it becomes important that you consume food at home rather than look for fast food outside. Bread is one of the most common foods that is an excellent option while consuming a filling snack. There is a common myth that grain products like bread and pasta are fattening. Grains are divided into whole grains and refined grains. Whole grains are a source of protein, fiber and certain other important vitamins and minerals, as it contains all the parts of the kernel. On the other hand, refining the grains reduces about 25% of its protein. Whole grains are used in the preparation of brown rice, whole wheat bread, and pasta. Opt for brown bread instead of white bread, brown rice in the place of white rice for a healthy weight loss. Packing the refrigerator with fresh fruits and vegetables can help a long way in taking care of your weight loss goals. Consuming whole fresh fruits instead of canned juices helps one prevent any weight gain. Completely avoiding all dairy products may not aid in your weight loss process. Dairy products offer a lot of vitamins and minerals that are needed for the proper functioning of the body. Replace the whole fat dairy products with low-fat versions or skimmed products in your pantry. A healthy meal means that one-third of your plate is covered with fruits, vegetables and grain products. While shopping to stock your pantry keep this in your mind. A basic meal plan can be made from including the essential components (fruits, vegetables and wholegrain foods) with a daily course of dairy products that is important for your health. When you stock your pantry, it would be wise to maintain a notepad, to write down what you eat, so that you plan your weight loss or weight gain. According to researchers from University of Colorado Health Sciences Center, food diaries help one to identify areas where one can make changes and help them lose weight. Wilson, N. L., Just, D. R., Swigert, J., & Wansink, B. (2016). Food pantry selection solutions: a randomized controlled trial in client-choice food pantries to nudge clients to targeted foods. Journal of Public Health, 39(2), 366-372. Akobundu, U. O., Cohen, N. L., Laus, M. J., Schulte, M. J., & Soussloff, M. N. (2004). Vitamins A and C, calcium, fruit, and dairy products are limited in food pantries. Journal of the Academy of Nutrition and Dietetics, 104(5), 811-813.